My last visit to St Andrews, to take part in the StAnza Festival of five years ago, occurred on the very day Britain, the US and its allies began the invasion of Iraq: 20th March, 2003. Five years on, we are still occupying and desecrating Iraq and its citizens. Hardly surprising then, that the StAnza festival this year is focussed on the theme of ‘poetry and conflict'. The scale of the disaster in Iraq is truly impossible to imagine. The best recent estimate calculates that the occupation has cost the United States alone three trillion dollars and that the impact on the rest of the world is reckoned to be a further three trillion dollars. The number of lives lost, at least the numbers of Iraqi lives lost, remains much harder to calculate. As do the financial and human costs resulting from the soaring price of oil and its effect on the global economy; basic food prices in developing countries have risen by more than a third in the past year. Facts such as these are as horrifying as they are overwhelming. They leave us feeling powerless, numbed by their scale. I'll be coming back to MacNeice later because I want to look at how he responded to the build up to the Second World War in his own writing. To suggest that, despite the pessimism - or hard-nosed realism - of those remarks I've just quoted, in the poetry he wrote at the time he faced up to the fact of war in an agile, and very compelling way. Poetry provokes a great deal of anxiety, doesn't it? Especially today when poetry is routinely dismissed as being utterly irrelevant, difficult, boring, out of touch, out of date. Poetry is trouble. Ever since Plato crowned us and banned us from his imaginary utopian republic, poets have been on the defensive, forced to justify what it is we do and why it might be of some small significance in the larger scheme of the self-important busy world. Freud talked about how neurotic symptoms are ‘over-determined': they always have too many causes to make logical sense, and that this alerts the analyst to the fact that there is something going on that the symptom is trying to disguise. I've long suspected that there is something ‘over-determined' about the anxiety poetry provokes in us, in our society. If poetry truly were as pointless, boring and irrelevant to the world we live in, why would people bang on about it all the time? Surely, it would just go out of fashion and be forgotten about, like horse-drawn charabancs. Why would people get so het up about how utterly meaningless it is? I want to use this opportunity to consider the ‘point' of poetry, and to examine the response of a variety of poets who have lived through times of extreme conflict. Finally, I want to make a suggestion: that translating poetry is the opposite of war. When we consider the ‘point' of poetry, those of us in the English-speaking world inevitably will have that damned line from Auden's ‘In Memory of W B Yeats' echoing through our heads: ‘Poetry makes nothing happen'. ‘Poetry makes nothing happen' is the fear that haunts all poets - well, I'd like to think it haunts all poets -- particularly those of us who live in the west, where poetry so often seems to be some kind of arcane, elitist, exclusive entertainment for the over-educated. What on earth is the point of writing poetry? Especially the kind of post-Romantic lyric poetry endorsed by the literary establishment that I find myself engaged in producing. Poetry, Auden implies, doesn't much affect the public world, and neither does it have a clear function in the marketplace. So what does it do? Poetry ‘survives', occupying the real places we inhabit, the places we believe and die in, places that are solitary and often sad. Having argued that ‘poetry makes nothing happen', Auden says that poetry, instead, survives as a way of happening, a mouth. As Auden's colleague, Louis MacNeice, suggested in his book about W B Yeats, ‘The fallacy lies in thinking that it is the function of art to make things happen, and the effect of art upon actions is something either direct or calculable.' If we ask poetry to be political in a vulgar sense then we end up with vulgar answers and vulgar poetry, the kind of poetry that isn't poetry at all, but propaganda. But, if poetry doesn't have a political function as such, does this mean that we have to adopt a high-art position about it, one that would argue that it lives in a hermetically-sealed aesthetic realm of its own, immune to history and politics, a form of decoration to get us through the dullness of twenty-first-century anomie? This art-for-art's-sake argument stems from the same philosophical misapprehension, the same paradigm, which clings onto a reductive function for poetry. One says that poetry must have a political function. The other that it can't have a political function. The problem, of course, is with the notion of function. Both of these linked positions view poetry teleologically, examining it from the perspective of what's perceived to be its final ends: entertainment or revolution. But: when the house painter crushed the workers. But: when the great wars were being prepared for. But: when the great powers joined forces against the workers. What Brecht seems to be saying is that poetry is impossible in ‘dark times' because poetry addresses itself to issues which the dark times crush into irrelevance. But he also reminds us that silence is no option. Those born later will want to know why poets gave up. What Brecht is doing here - and what makes him into one of the greatest poets of the twentieth century - is working through his dilemma as a radical lyric poet in front of us. He shows us the things that poets want to write about. And then he shows us how these human, natural, ordinary things are annihilated by Fascism. Lyricism vs. Rhetoric. He shows us both the impossibility of poetry and its absolute necessity, a necessity denied by ‘the house painter' and the overwhelming terrors of the approach of World War. Brecht, of course, is doing that very Brechtian thing: he's revealing to us the means and processes of artistic production, writing a lyric poem which displays the nerves and sinews of lyricism - and then showing its impossibility in ‘the dark times' he's struggling through. Classic Brechtian irony. Just as the dark times were beginning to dawn, in 1938 -- the time of Munich, cowardice and appeasement -- Louis MacNeice was writing a book called Modern Poetry.Subtitled, ‘A Personal Essay', he states his case in the opening sentence of its Preface: ‘This book is a plea for impure poetry, that is, the poetry conditioned by the poet's life and the world around him'. MacNeice was writing against the excesses of High Modernism, its remoteness from the quotidian world and its arcane elitism. This plea for ‘impure' poetry of course comes from the poet who, in arguably his most famous poem, ‘Snow', celebrates ‘The drunkenness of things being various'; ‘World is crazier and more of it than we think, / Incorrigibly plural', he reminds us. Understandably, then, MacNeice valued poets who were engaged with the craziness of world and who had a sense of themselves as a part of a various, incorrigible world. In Modern Poetry, he writes, ‘I would have a poet able-bodied, fond of talking, a reader of the newspapers, capable of pity and laughter, informed in economics, appreciative of women, involved in personal relationships, actively interested in politics, susceptible to physical impressions'. Someone, unsurprisingly, just like MacNeice himself - and Bertolt Brecht for that matter. At the same time, against the background of the Munich crisis and the collapse of Republican Spain, MacNeice was also writing Autumn Journal, a book-length poem that many regard as his masterpiece. Throughout the poem he darts from his own intimate, subjective experiences to headlines in newspapers announcing Hitler's triumphs. The mundane, personal details of everyday life are juxtaposed to public events, the significance of which are of overwhelming political and historical consequence. Implicitly, he tells us that we cannot conceive of the intimate without the historical, that subjectivity is already implied in objective events, and vice versa. Or, as that famous feminist slogan of the 1970s puts it, ‘the personal is political'. In response to his publisher, T S Eliot's request for a summary of Autumn Journal for the Faber catalogue, MacNeice described how, ‘It contains reportage, metaphysics, ethics, lyrical emotion, autobiography, nightmare'. Instead of perhaps putting his own ‘petty' concerns to one side in order to write ‘political' poetry about the build-up to war, MacNeice demonstrates how personal life is political life. As a result, his ‘impure', ‘incorrigibly plural' poetry scrutinises, as he told Eliot, the ‘different parts of myself (e.g. the anarchist, the defeatist, the sensual man, the philosopher, the would-be-good citizen)', examining a range of emotions from boredom to terror to indifference that accompany the inexorable journey to historical catastrophe. With narrow bands of blue. In the Preface to a collection of poems that was never to be published in his lifetime, Wilfred Owen wrote, ‘All a poem can do today is warn. That is why true poets must be truthful'. And I think that it's this quality of truthfulness that makes Autumn Journal is such an unnerving, and engaging, read today. In Autumn Journal MacNeice is a true poet being truthful about the complexities of his times and, crucially, about himself. His ‘impure' poetry is of its ‘impure' times. He warns us what it is like to live with the dread of impending cataclysm. He reminds us that our so-called ‘selfish', personal concerns continue to be uppermost most of the time. That the ‘would-be-good citizen' lives side by side ‘the defeatist' and ‘the sensual man'. MacNeice frets about his missing dog (who, incidentally, turns up in the next line). He notes the weather as Hitler rants in the background. And he mourns the felling of trees on Primrose Hill to make way for anti-aircraft guns. The latter an observation that, when placed in the context of Brecht's wry comment, ‘A talk about trees is almost a crime / Because it implies silence about so many horrors', seems particularly charged. The destruction of MacNeice's beloved trees, their exposed flesh, ‘white like the roast flesh of chicken', are themselves, in that particularly powerful image, emblematic of the ‘horrors' to come, as I'm sure Brecht himself would have appreciated. But, as David Constantine records, he ends that entry in his journal on a different note: ‘Such poetry is a message in a bottle, the battle for Smolensk is also a battle for lyric poetry'. How can Brecht, of all people, argue that the battle for Smolensk - the first Soviet counteroffensive against the Nazis, during which 93% of the city was destroyed - is also a battle for lyric poetry? Especially given that, as we've seen, only moments before, he acknowledged himself to be deeply uneasy about the ‘quaint, eccentric, closed-off' nature of lyric poetry? ‘Such poetry is a message in a bottle'. Why? Two years earlier, in 1940, Brecht, then living in exile in Finland, was unsettled by chancing upon Wordsworth's Lucy poems in an anthology - poems that, he admitted, he'd be inclined to dismiss as ‘petty-bourgeois'. But Wordsworth's lyrics moved him. Attempting to analyse why, he argued that, ‘precisely in this inhuman situation "a lovely apparition sent / to be a moment's ornament" may awaken a memory of situations more worthy of human beings". In other words, in the midst of the worst, something as simple and beautiful as a lyric poem may awaken in us a sense of our own humanity. A ‘message in a bottle', something as tender and unassuming as Wordsworth's small lyric, is the antithesis of what Hitler was attempting to impose upon Europe. The battle for Smolensk -- indeed, all battles against totalitarian, fascist regimes, be they fought with soldiers and ordnance or on a far more modest scale - can be seen as battles for lyric poetry. For the right to experience and express the delight we find in the ordinary world around us. Strange as it may seem to those of us fortunate to have lived our lives in peace, the right to joy is a potent threat to totalitarianism. If poetry makes nothing happen, the CIA in the late ‘forties seemed to think otherwise. Indeed, for a brief period, art in general became an important weapon in the Cold War. For example, in the late ‘forties, the CIA decide to promote (and covertly fund) the work of the Abstract Expressionist painters - such as Jackson Pollack, Mark Rothko and Willem de Kooning - repackaging them as the high priests of individualism, in order to demonstrate the superiority and complexity of western art over the ‘girl meets tractor' clichés of Socialist Realism. They also covertly funded magazines such as Encounter and Partisan Review, enabling them ‘to offer large sums in payment for single poems by East European and Russian poets'. As those of us fortunate enough to be brought up reading these excellent translations of Russian and East European poets - poets who'd been ignored, persecuted, and indeed murdered, by the Soviet system -- this was an extremely effective tactic. Readers of Mandelstam, Tsvetaeva, Pasternak and Akhmatova, to name only the most famous, were able to grasp the misery and terror of living under totalitarianism - as well as the courageous resistance and resilience it provoked, and the magnificent poetry it inspired. So, if poetry truly makes nothing happen then why, we might well wonder, do authoritarian states go to such lengths to control it? The CIA actively encouraged the translation of East European poetry into English as a (very effective) means of countering Stalinist propaganda. I'm not suggesting that the poets themselves were not worth translating - clearly they were -- nor that their translators knew how their work was being supported (they didn't). The point is that the CIA recognised that the translation of poetry could be a political act with significant consequences. It's a commonplace to observe that all art goes through radical forms of development when it is exposed to something entirely new and unexpected. Think of the way that modernist painters - Picasso most famously - were challenged to produce daring new art as a result of their exposure to African masks. Poetry in English is no exception. Some of the greatest innovations in English poetry have occurred as a result of translation. Around the same time that Picasso became obsessed with African sculpture, T S Eliot was immersing himself in French poetry, absorbing its responses to modernity that challenged what was deemed acceptably ‘poetic' in early twentieth-century English verse. From Chaucer's version of The Romance of the Rose, via Wyatt's introduction of the sonnet by translating Petrarch, Dryden and Pope's reclaiming of the Classics for their Augustan ends, to the influence of Chapman's Homer on John Keats, English poets have flourished in response to translations. And, more recently, think of the impact of the Penguin New European Poets series on poetry today; how it made the great Eastern European poets into our contemporaries, as well as introducing us to the major poets of Latin America. What doesn't get translated and published is, of course, as fascinating as what does. André Lefevere has noted that "Of all the great literatures of the world, the literature produced in the Islamic system is arguably the least available to readers in Europe and the Americas." The most famous exception, of course, is Edward Fitzgerald's Rubaiyat of Omar Khayyam (1859) which, as Lefevere reminds us, ‘Introduced the roba'i, or quatrain, into European poetics', a form popular with many poets until it fell out of favour in the 1920s. At the height of the British Empire, Edward FitzGerald's Rubaiyat of Omar Khayyam succeeded in turning a Persian medieval poet into a highly fashionable author. But since that time - with the notable exception of Ezra Pound's Cathay(1915) -- it is striking how the poetry and cultures of non-European, and specifically, Islamic countries have been largely greeted with ignorance and smug indifference. 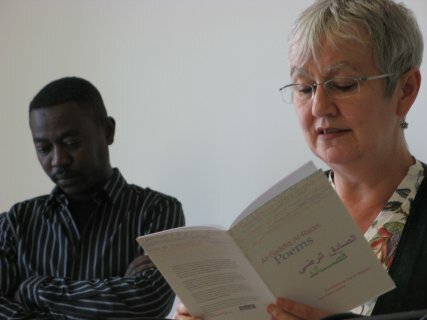 In recent years there has been a slow increase in the number of translations of non-European poetry being published in the UK, particularly of Arabic verse. The results in this instance, though highly commendable, are as yet uneven, and the work often appears to be aimed at an audience interested in Arabic culture rather than in poetry, per se, though this does appear to be changing as standards are raised and more mainstream literary organisations, publishers and venues begin to take Arabic poetry seriously. However, this is a very different situation from the response given to many contemporary East European and Russian poets (Brodsky, Miłosz, Herbert, Holub, Sorescu, Szymborska: all translated to a very high standard) whose new books tend to be read and reviewed on the same terms as English-language poets and whose translations are included in anthologies alongside poems in English without a second thought. Indeed, contemporary poets from the old Eastern Bloc countries are far better known in the UK than those from Western Europe. For which it appears we have the CIA to thank. Though I can assure you that the Bush administration CIA has yet to release vast sums to be spent on translating poetry from Islamic countries. But then the Soviet Union was a feared enemy that required undermining rather than conquering. Whereas fostering engagement with the cultures of people you only wish to vanquish is not a wise strategy, since reading their poetry might encourage your own people to regard them not as ‘the enemy ‘ but as cultured human beings. When, in 1996, I was the first writer sent to Palestine by the British Council, I decided that I was going to use my position in the British poetry establishment to encourage and promote the translation of Palestinian and Arabic poetry. I wanted people to recognise that the Palestinians, Arabs, and Muslims in general, have an extraordinary rich and complex culture, culture that is most importantly expressed in their poetry since, in Islamic societies, poetry is regarded as the highest art form and is accorded great importance. This has come about for two reasons. One is the absolute reverence accorded to language because of the centrality of the Koran. Unlike the Bible which simply records the words of God, the Koran is God speaking to us in what is often described by native Arabic speakers as the most beautiful language ever written down. The other reason is that many of the peoples who became converted to Islam come from nomadic societies and for most of them, poetry is their only art form of significance. In a nomadic society, everything has to be portable. Nomads often make beautifully elaborate carpets, fabrics, jewellery and pottery, but the art and architecture of western societies has no relevance for them. Instead, the means by which they express themselves, record their histories and articulate their identities is through poetry. Our, peculiarly western, anxiety that ‘poetry makes nothing happen' is greeted with hilarity, bafflement and incredulity by the poets I've been privileged to make friends with, many of whom come from the most conflict-scarred places on earth such as Iraq, Afghanistan, Somaliland, Palestine and Sudan. They can't understand why anyone could possibly think that poetry could be irrelevant since, to them, poetry is de facto, the most important - and relevant - art form of their cultures. Taking the CIA, and its Cold War stance on the significance of translating poetry from behind the ‘Iron Curtain', as my inspiration, I decided to devote my energy to translating the poetry of those cultures that currently we are so efficiently plundering and dismantling. Translating poetry, especially if, like me, you don't speak the language of your poet, demands patience and humility. What I've never wanted to produce are those show-off translations, so beloved of some of my colleagues, who use a distinguished poet's work to further their own careers and who have a cavalier attitude (at best) to the original poet' genius. The final word on such behaviour can be safely left to Friedrich Nietzsche who, when commenting on the Imperial Roman fondness for this practice, noted that ‘In those days, indeed, to translate meant to conquer... in the sense that one would delete the name of the poet and insert the translator's name in its place.' I'm not denying that translations carried out from this perspective can have an exciting and rejuvenating effect on the British poet's work and produce fine poetry in English. But what interests me is putting the original poet first, not myself. Translation - other than by the Imperial method - is, as I suggested, the opposite of war. Good translations depend on the translator putting their talents as a poet at the service of another poet. They depend on a deep attempt to fully engage with the ‘otherness' of that poet, their culture and their language in order to find effective ways of admitting that otherness into English, thus expanding the boundaries of English poetry. The more open you are to the rich heritage of the poet you're translating, the better and more effective your translation will be as a new poem in English. Translation is the opposite of war because, as Umberto Eco argues in his detailed and practical examination of the subject, it depends on negotiation, and ‘Negotiation is a process by virtue of which, in order to get something, each party renounces something else, and at the end everyone feel satisfied since one cannot have everything.' And war, of course, starts when negotiation fails. Translation always involves the translator taking a position -- an aesthetic position and an ethical position. Does the translator wish to negotiate with, or to dominate, the poet they're translating? Is their main aim to enhance their own reputation, or do they want to introduce a new voice into English poetry by attempting to render the original poet's own work as vividly and vitally as possible? Plundering another poet's work to produce yet another riff on your own anomie is child's play. The real difficulty is to engage as fully as possible with the poet you're translating, and their culture, in an attempt to bring as much of the original as possible into English. As Walter Benjamin wrote, in arguably the twentieth century's most important essay on translation, ‘It is the task of the translator to release in his own language that pure language which is under the spell of another, to liberate the language imprisoned in a work in his re-creation of that work. For the sake of pure language, he breaks through the decayed barriers of his own language.' There's a whole world of wonderful poets out there, aching to be translated into English. Not just for their sake, but for the sake of poetry in English. ‘To imagine a language means to imagine a form of life' wrote Wittgenstein. And it is this radical act of imagination that English poetry urgently needs to perform. In 2004, with the support of a generous grant from Arts Council, England, I founded The Poetry Translation Centre. The centre emerged from the poetry translation workshops I'd begun leading two years earlier when I'd been appointed as the Royal Literary Fund's Writing Fellow at the School of Oriental & African Studies, part of the University of London. The workshops had brought together translators from a wide range of backgrounds who were eager to introduce contemporary poets to English audiences by collaborating to produce effective translations of their work. Our fortnightly workshops remain our core activity. They're enormous fun, are profoundly stimulating and they give a fascinating insight into the language and culture of the poets we translate. The past three workshops we've held were spent translating a magnificent, harrowing long poem by the Mexican poet, David Huerta, called ‘Nine Years Later: A Poem Dated', that's concerned with the poet's attempts to write about the horrific events of 1968 when the Mexican government opened fire on a demonstration by unarmed students. Our next workshop will be devoted to translating a poem from Hebrew by Tuvya Ruebner, a principled opponent of the Israeli occupation. After that, we'll be looking at work by Abdul Rahman al-Abnudi, a poet writing in Egyptian Arabic. And coming up later on we have translations from Pashto, one of the main languages of Afghanistan, Kurdish (a young woman poet from Iraqi Kurdistan called Kajal Ahmed), Tajik (one of the most important poets writing in Persian today is Farzaneh Khojandi who lives in Tajikistan), Urdu and Somali - to name but a few. In 2005 we organised our first World Poets' Tour, bringing six leading international poets - from Afghanistan, India, Indonesia, Mexico, Somaliland and Sudan - to the UK for a series of readings and events. All the poets were co-translated by British poets, including David Harsent, Carole Satyamurti, Katherine Pierpoint, Jane Duran and Mark Ford, who worked closely with language experts to produce wonderfully vivid, powerful new poems in English. The tour was an unprecedented success, most notably among the large communities of Afghans, Sudanese and Somalis based here who, perhaps for the first time, felt that their cultures were understood, respected and appreciated, and who were thrilled to be in the company of poets who meant such a great deal to them. It's very hard to give a British audience a real sense of how important, and how famous, Maxamed Xaashi Dhamac ‘Gaarriye' - the poet from Somaliland we brought to the UK in 2005 - is to Somalis. It was a bit like being on tour with John Lennon in 1963: he was mobbed wherever he went, Somalis of all ages lining up to have their photos taken with the great man or just to be in his presence. Initially, he'd only intended to stay in the UK for a month, but the Somali community prevented him from going back to Hargeysa for a further three months, such was their excitement at his being here. Gaarriye's poetry doesn't make something happen: it is itself a ‘happening'. His poetry is one of the main articulations - the engine, if you like - of Somali culture and identity, and that of course includes Somali political identity. Gaarriye has received the unusual accolade, for a poet, of a death threat, pronounced in 1980 by the Somali dictator, Siad Barre, in retaliation for his poem attacking the clan-based, divisive structure of Barre's regime. Gaarriye began a chain of poems, a common device in Somali poetry, which one poet initiates and then to which others contribute. Gaarriye's incendiary chain was 70 poems long in the space of four months. Barre was so incensed that he declared anyone caught in possession of a cassette tape of the offending poem would be executed, such was its potency. Soon after, Gaarriye escaped into an exile that would last 11 years, until Barre was overthrown. The young Sudanese poet, Al-Saddiq Al-Raddi, also found poetry to be a potent weapon against a dictatorship. When Saddiq was 20 years old, in 1989, the democratically elected government of Saddiq al-Mahdi was overthrown in a coup by Omar Al-Bashir, who still grips the country in his Islamist fist. Business as usual with a coup, all newspapers and radio and TV stations, other than channels promulgating government propaganda, were closed forthwith. In the face of such a clampdown, Saddiq - who was already well-known in Sudan for his outstanding lyric poetry - decided with some other young poets to stage impromptu, guerrilla-style poetry readings. They went secretly from town to town, often beginning their readings, unannounced, in the streets. Sometimes, they'd attract audiences of three or four thousand people to university lecture halls or sports stadiums, who were desperate to hear their poetry. Needless to say, they were eventually caught, imprisoned and tortured for daring to recite poetry on the street. But Saddiq is not a ‘political' poet. He eschews the term, and he hates it that people in the west are obsessed by the facts I've just mentioned. He is a lyric poet. His poetry gains a political charge simply because he's attempting to write, publish and encourage the production of the kind of poetry that dictators find so troubling. Poetry that moves people, that allows them to feel the kinds of emotions deadened and controlled by totalitarian regimes, poetry that allows them to think and make connections for themselves. Poetry that, as Brecht put it, ‘awaken[s] a memory of situations more worthy of human beings'. Here's Saddiq's poem, ‘Lost', taken from a sequence called, ‘Weaving a World'. ‘October' and ‘April' in the poem refer to the uprisings in Sudan, in 1964 and 1985, respectively, against the dictatorships of General Abood and General Numairy. might nurture this aching for home. with what seeps from a forgotten wound. What's more, Saddiq has a very powerful sense of himself as a Sudanese poet, and this Bashir's regime does find directly challenging since - as you will have gathered from the current atrocities being carried out in Darfur -- it is intent on promulgating a version of Sudanese culture that is exclusively Islamist and Arabic in a country of Muslims, Christians and animists where 300 languages are spoken. Saddiq's poetry is infused with a sense of the complexity of his Sudanese identity: he is an African speaking Arabic whose poetry explores and celebrates his ancient culture's remarkably diverse heritage. His is a poetry of promiscuous sources that refuses a codified identity. Like Louis MacNeice, his is an ‘impure poetry'. Furthermore, he is currently engaged in a programme of mutual translation that brings together those poets from the north of Sudan who write in Arabic and those of the south, where the lingua franca (thanks to British rule) is English. The last thing Bashir's regime wants is for people from the north and south to come together and share something profound they have in common: poetry. One of the things that pleased Saddiq most about having his poems translated into English was that, for the first time, his friends from the south of Sudan finally could understand his poetry, and now he is determined to return the favour by helping to translate their poetry into Arabic. Poets such as Gaarriye and Saddiq of course come from societies and cultures that are very different from the mainstream British culture. Though it's worth remembering that living here are countless thousands of people for whom poetry is the supreme art form, and we would do well, I think, to get to know them, and their poetry, better. We British poets living here are remarkably fortunate in that we have not had to risk imprisonment, torture, banning or exile for the sake of our art. Because we don't write poetry under conditions of extreme pressure and fear, we lose sight of the significance of lyric poetry. We have no concept of how essential, how politically charged, the right to experience joy can be not only in the face of totalitarian repression, but in response to the numbing chatter of the everyday obsessions of late capitalist anomie. To state the baldly obvious: the peculiar anxiety in contemporary western societies that poetry provokes stems from the fact that it isn't ‘plain prose'. Archaeologists think that there have been human societies in existence now for roughly 100,000 years. Anthropologists have yet to stumble across a group of humans living together who do not attach profound importance to poetry, or verbal art of some sort. Poetry is endemic to humanity. Language is what divides us from the primates, so it's hardly surprising that, having acquired and mastered it, we want to celebrate and play with its potential through making poetry. But it is only in the past three hundred years, initially in Europe and then later in its colonies, that prose, specifically in the form of the novel, has taken over from poetry as the dominant language-based art form - though we should bear in mind that, for most of the habitable world, poetry continues to retain its primary status. The ‘rise of the novel', as the literary critic, Ian Watt, called his ground-breaking book of that name, is congruent with the rise of capitalism, with the development of individualism, personal life, privacy, the Protestant notion of conscience - all the things that we now think make us who we are. It is the novel's job to articulate and instruct us in those values. It is through novels that we learn how to be ourselves, how to find our place in the infinite complexities of the world around us. One of the reasons, I think, that poetry provokes such anxiety in contemporary western society is that it resists fulfilling that role of instruction upon which the edifice of the novel rests. (That said, there is clearly a whole sub-genre of poetry, very evident, for example, in contemporary American poetry, which ‘instructs' its readers in how and what to feel, with all the sentimentality and banality of a self-help manual.) As Plato recognised, real poetry unsettles us, it stirs our emotions. Adrienne Rich once called poetry ‘a wick of desire': ‘It reminds you' she said, ‘where and when and how you are living and might live'. And in all this, it is something about the form of poetry that is so provocative. In the 1920s, the Russian critic Roman Jakobson, a pioneer in the emerging discipline of structural linguistics, suggested that language operated along two axes: the horizontal axis of metonymy and the vertical axis of metaphor. The engine of the novel is metonymy, the part for the whole, the attempt by the protagonist to reach the end of the story by achieving a settled self-identity, displacing one plot device for another to complete this horizontal trajectory through prose. But poems are very different structures. Metaphor causes them, and their readers, to double-back on themselves, to circle round for another glance. It is as though prose, hurtling towards its end consuming itself as it goes, operates in a two-dimensional world. Whereas a poem happens in 3-D. A poem needs to be taken up and examined very carefully, many times, from a variety of perspectives. Its foregrounding of its music, its strange, self-conscious devices -- like rhyme, rhythm and complex verse forms - draw attention to itself, separate it from quotidian language. As Plato said, reduce a poem to plain prose and it's gone. Paraphrase its metaphors, sum up its ‘content', and the magic vanishes as swiftly as a magician whose hat is missing its rabbit. Metaphor - which, as you know, in Greek means ‘to transfer, to carry, to bear' - is the defining methodology of poetry. Using metaphor, the poet can bring together elements which, in ordinary life, are kept apart, juxtaposing incidents and details from radically different discourses and facets of life, ignoring the logic of metonymical progression, of one damned thing after another, which is the logic of separation. This is what MacNeice does in Autumn Journal: he juxtaposes the different aspects that come together to make up his life, he makes connections. And the musicality of his language, the vividness of his imagery, purge from us that film of familiarity and let us feel the world he inhabits as though we were there by his side on a damp, still evening in 1938, with Hitler yelling on the radio, watching the trees on Primrose Hill be felled. Every authentic poem contributes to the labour of poetry... [which is] to bring together what life has separated or violence has torn apart.... Poetry can repair no loss, but it defies the space which separates. And it does this by its continual labour of reassembling what has been scattered. Louis MacNeice, The Poetry of W B Yeats (London: Faber & Faber, 1941) p. 39. W H Auden, Collected Shorter Poems 1927-1957 (London: Faber & Faber, 1966) p. 142. Bertolt Brecht, ‘To Those Born Later' from Poems 1913-1956 edited by John Willett and Ralph Manheim (London: Eyre Methuen, 1976) p. 318. Quoted in Jon Stallworthy, Louis MacNeice (London, Faber & Faber; 1995) p. 231. Louis MacNeice, Autumn Journal (London, Faber & Faber; 1939) vii, pp.22-23. The Collected Poems of Wilfred Owen, edited by C Day-Lewis, (London, Chatto & Windus; 1963) p.31. Bertolt Brecht, quoted by David Constantine in ‘The usefulness of poetry' in Bertolt Brecht's Poetry of Political Exile edited by Ronald Speirs (Cambridge, Cambridge University Press; 2000) pp. 29-46, p.42. Frances Stonor Saunders, Who Paid the Piper: The CIA and the Cultural Cold War ( London; Granta Books, 1999) p. 355. André Lefevere, Translation, Rewriting and the Manipulation of Literary Fame (London & New York; Routledge, 1992) p.73. Edward Fitzgerald, cited ibid p.75. I'm using the term here in Edward Said's sense; see Orientalism: Western Conceptions of the Orient (London; Routledge, Kegan & Paul, 1978). See my essay ‘Translation' for a discussion of Cathay; Poetry Review Vol. 94, Winter 2004/05, pp. 52-61. See Salma Khadra Jayyusi (ed.) Modern Arabic Poetry (New York; Columbia University Press, 1987); The Literature of Modern Arabia, (London; Kegan Paul, 1998); Modern Palestinian Literature (New York; Columbia University Press, 1992). Also Margaret Obank & Samuel Shimon (eds.) A Crack in the Wall: Modern Arab Poetry (London; Saqi Books, 2001) and Banipal: Magazine of Modern Arab Literature. I feel I need to point out here that I'm using the term ‘Islamic' in the way I'd refer to European societies as "Christian": as a matter of history and culture, not of faith. I have yet to meet an "Islamist" Arabic poet: they're all unreconstructed, secular Leftists. Like me. Friedrich Nietzsche, "On the Problem of Translation" (1882), Schulte & Biguenet op. cit. p.69. Umberto Eco, Mouse or Rat: Translation as Negotiation (London; Weidenfeld & Nicolson, 2003) p. 6. Walter Benjamin, "The Task of the Translator"(1923) in Schulte & Biguenet op. cit. pp. 80-81. Ludwig Wittgenstein, Philosophical Investigations (Oxford; Basil Blackwell, 1968) p. 19 (8e). See Kevin Rushby, Unbroken Chain', published in The Guardian in October 2005 to coincide with the World Poets' Tour. Percy Bysshe Shelley, ‘A Defence of Poetry' in Shelley's Poetry and Prose, selected and edited by Donald H Reiman and Sharon B Powers (New York & London, Norton; 1977) pp. 505-06. Plato, The Republic, translated with an Introduction by Desmond Lee (Harmondsworth, Penguin; 1974); all quotations are taken from Book Ten. Adrienne Rich, What is Found There: Notebooks on Poetry and Politics (New York & London: Norton; 2003) p.241. John Berger, ‘The Hour of Poetry', in The Sense of Sight: Writings by John Berger, edited and introduced by Lloyd Spencer (New York: Vintage, 1993) p.249. Think of this definition next to Dr Johnson's famous description of metaphysical imagery consisting of ‘heterogeneous ideas... yoked by violence together'.